Combined Task Force 150 (CTF), one of three Task Forces within Combined Maritime Forces (CMF) conducted a successful disruption of a vessel carrying illicit cargo in the Indian Ocean, Apr. 13, 2012. HMS Westminster’s Merlin helicopter located a suspect dhow approximately 100 miles from the ships position before the ship closed the distance to conduct a compliant boarding. Commodore Jonathan Mead, Royal Australian Navy and Commander, Task force 150, directed British Warship HMS Westminster to search for, intercept and board the suspected vessel. The boarding was conducted in accordance with international law as the vessel was suspected of being without nationality. 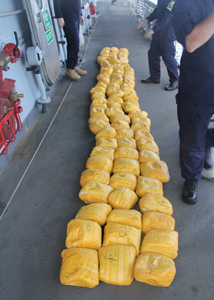 Searches revealed that the vessel was carrying over 180kg of pure heroin, with an estimated street value of approximately $22 million. On completion of the boarding of a suspect dhow, 180 kilograms of narcotics were transferred to HMS Westminster for testing and disposal. HMS Westminster has been on task since leaving the UK in January 2012 and has been involved in maritime security and counter-piracy operations in the Indian Ocean. Westminster uses her Merlin helicopter and embarked Royal Marines Boarding Team to conduct these operations. 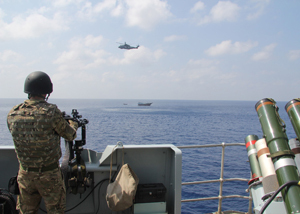 A suspect dhow was intercepted by HMS Westminster’s Merlin Helicopter and Embarked Royal Marine Boarding Team in the Indian Ocean. 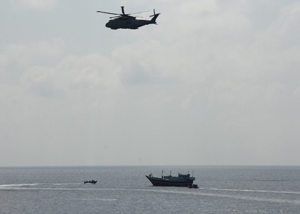 CMF operates to defeat terrorism, prevent piracy, reduce illegal trafficking of people and drugs, and promote the maritime environment as a safe place for mariners with legitimate business. 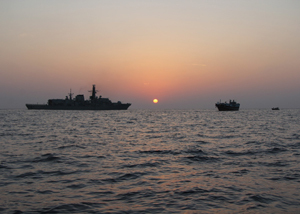 A suspect dhow was held in company with HMS Westminster overnight as Royal Marines conducted a full search of the Dhow.